Miss Esther O’Connor posing with the wooden statue of our mascot bird, the Harris’s Sparrow. The photo is undated but the carving, probably by George Kester, is dated 1979, so the photo probably dates to 1979-81. Esther received an award from BAS in 1981. 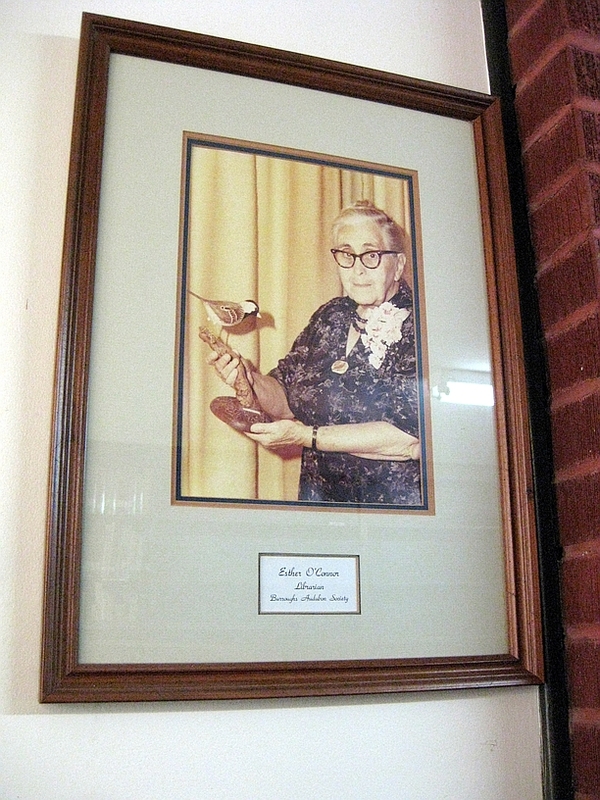 BAS History, Week 3: You will hear much more about this delightful lady, Esther O’Connor, during the coming year. One of our founding members and also our first librarian. Her wonderful collection of natural history books formed the foundation of our current library. Her photograph depicts her holding a hand-carved wooden statue of our “mascot bird”, the Harris’s Sparrow. The statue, by George Kester, is dated 1979. Esther received an award from BAS in 1981 so this photo was probably taken within those few years. You can view the statue (as well as the photo) if you visit BAS Library and Nature Center! 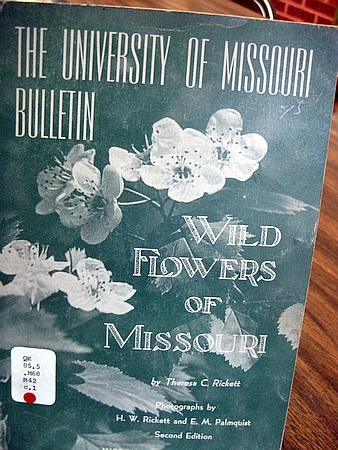 The 1954 precursor to the Missouri Department of Conservation’s wildflower guide. Given to Esther O’Connor by Martha Lafite Thompson. The Wild Flowers of Missouri book (1954) was a gift to Esther from Martha Thompson, who owned the property in Liberty, MO that later became the Martha Lafite Thompson Nature Sanctuary. 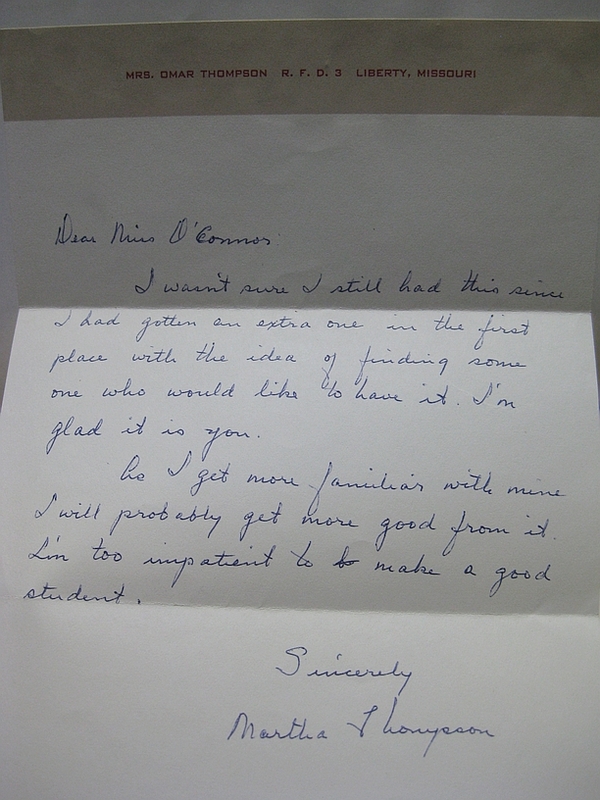 We found this letter preserved inside the book, written at the time that Esther was active in the Botany Group of Burroughs Nature Club and giving botany classes and field trips for its members. Esther preserved Martha’s letter inside the wildflower book. The property that would become MLT Nature Sanctuary was then simply addressed “R.F.D. 3, Liberty, Missouri”. This is a excellent blog. An excellent read. Is it OK to share on Linkedin? Keep up the terrific work! Thank you. Please feel free to share.